The Baptist Studies Bulletin (BSB) is produced by the Baptist History & Heritage Society and provides scholarly analysis, informed editorials, book reviews, and special features for subscribers. You may access previous issues to or subscribe or unsubscribe from the BSB. Republishing of articles is allowed, but please provide credit and a link back to the Baptist Studies Bulletin. Election day 2010 in America draws nigh, and Christians are angry and politicized. Representing 11% of Americans, the Tea Party movement, according to a recent survey by Public Religion Research Institute, is comprised primarily of Christians, most of whom self-identity with the “conservative Christian movement” and most of whom are Christian nationalists. This largely Christian political movement is comprised of persons who are mostly white males, while the coalition itself draws far more support from the South than any other region of the nation. Tea Partiers love Sarah Palin and are Republicans. Conversely, they despise Barack Obama and the Democratic party, and trust Fox News to tell them the truth. The Tea Party movement decries the federal government and voices allegiance to states’ rights. Bankrolled by billionaires, Tea Party participants are largely wealthy and affluent individuals. Are there any historical parallels to the twenty-first century Tea Party movement? From 2002 to 2008, prior to the beginning of the Tea Party, I researched and wrote my dissertation focused on the subject of Baptists in Middle Georgia during the American Civil War (the dissertation is slated to be published in book form in 2011). As the Tea Party movement took root and unfolded in the spring of 2009, initially voiced in complaints of over-taxation, I soon could not help but note the striking parallels between the movement’s language and antebellum and Civil War-era discourse in the American South. The rise of the Confederate States of America (CSA) was preceded by growing anger among white southerners who insisted they were bearing a greater tax burden than Americans in the North. Southern politicians in turn blamed the federal government for the unjust tax policies, and publicly argued that “states’ rights” took precedence over the federal government, a claim disputed by northern states. Amidst cries of unfair taxation and claims of states’ rights, the South’s white politicians and slaveholders (with much overlapping between the two) took an increasingly hard line stance on the right to own slaves (the southern economy, almost exclusively agricultural, was dependent upon slave labor) in the face of growing opposition to slavery in the North. The trigger came in 1860, as the Republican Party, committed to restricting (but not, at that time, eliminating) slavery, won the presidency in the person of Abraham Lincoln. Southern white politicians derided Lincoln as the enemy who would free black slaves to wreck havoc upon the South. Following Lincoln’s election, many slaveholders in the South began agitating for secession from the United States of America. In February 1861 the Union dissolved, in the minds of white southerners, with the formation of the Confederate States of America. For the next four years, white southerners fought valiantly to defend their social, cultural, and racial identity, and preserve their “honor” – while claiming the moral mantle of America’s Revolutionary-era spirit. By the time the Civil War began, white southern Christian leaders (Baptists not excepted) were firm (with some notable exceptions) advocates of black slavery and states’ rights. Indeed, the antebellum splintering of Christians North and South, including the formation of the Southern Baptist Convention in 1845 (formed from a gathering of principally large, wealthy slaveholders), was in no small part the public positioning of white Christians in the South as firmly pro-slavery. From pulpits, many Christian ministers in the South echoed political calls for secession following Lincoln’s presidential victory. During the Civil War years, white southern Christian leaders often voiced support of slavery, framed freedom and religious liberty in terms of the rights of whites, and spoke of the CSA as God’s chosen nation to bring about His will for the human race on earth. My research into Baptists in middle Georgia during the Civil War, however, revealed some interesting nuances. Many congregations did not respond to Baptist leaders’ calls to engage in Christian nationalist rhetoric. Some congregations, throughout the duration of the war, chose to offer no comment upon the conflict, while others routinely expressed support of the Confederacy. No two associations responded to the Confederacy in the same manner. Individual white Baptists often claimed freedom for themselves, not for blacks. And the Baptist commitment to religious liberty and separation of church and state suffered as many Baptist leaders strained their faith heritage to accommodate Christian nationalism. In the end, southern white Christians (and the South at large) lost their war with the North, although for another century they used politics and violence to ensure that white supremacy retained control of southern culture and society. Are there lessons to be learned from the antebellum and Civil War South? Perhaps. One might argue that the Tea Party movement is fighting the same political, cultural, and social battles that southerners of old fought. If so, however, the battleground is much different today. America over the years has become what our Baptist forefathers of the seventeenth and eighteenth centuries sought: a pluralistic nation founded upon a secular government that seeks to treat all citizens as equals and keeps religion and state apart. White, southern Christian nationalists may (yet) have one of the loudest voices in the current political, cultural, and social climate, but the future of America is ultimately rooted in the ethnic, racial, and religious diversity that is America of the twenty-first century. What is a Baptist? It is a question as old as Baptists. From their beginning days in 1609, Baptists have been a diverse, and often disagreeable, lot. Mystifying their opponents and defying easy classification, Baptist leaders through the centuries have stood on both sides of just about every historical conflict and issue, both religious and political. One of the current Baptist disputes in the 401st year of conflicts began publicly unfolding in North Carolina last month, and has since claimed the attention of many Baptists nationwide and beyond. In short, it is the latest incarnation of an old story: some Baptists (led by a select group of theologians and their supporters, in this case) are striving for Christian unity via theological conformity (utilizing ancient church creeds as the stack pole), while others (led by Baptist historians, but including a diverse group of educators and pastors) argue for the centrality of freedom of conscience as articulated by Baptists throughout their history. Of the two groups, the former asserts that the need for ecumenical unity supersedes individual conscience. The latter group argues that the Baptist community historically placed freedom of conscience front and center. What is a Baptist? The answers to this question are as important in this century as they were in the 17th century. 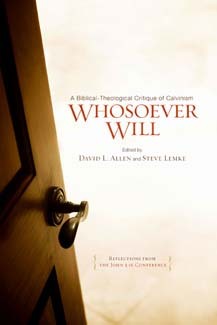 David L. Allen and Steve W. Lemke, Whosoever Will: A Biblical-Theological Critique of Five-Point Calvinism (Nashville, Tenn.: Broadman & Holman, 2010, 306 pages, paperback). Calvinism, also known as Reformed theology or the “doctrines of grace,” is a significant force in contemporary Southern Baptist life. Christianity Today recently profiled Southern Baptist Theological Seminary president, Albert Mohler, in a cover story entitled “The Reformer.” Presiding over the Calvinist resurgence in the Southern Baptist Convention, Mohler is considered by many to be the most influential voice within the SBC. Hence this provocative and popular volume edited by Allen and Lemke, published by the SBC’s publishing arm. A self-proclaimed response to Calvinism, the book is a series of essays by Southern Baptist preachers, denominational leaders (Paige Patterson and Richard Land), and professors. Collectively, the contributors push back against Mohler, John Piper, R. C. Sproul, Southern Seminary, Founders Ministries, and other five-point Baptist Calvinists, past and present, in addition to Calvin and the Synod of Dort. One cannot come away from this volume without realizing that Calvinism represents a very serious divide within Southern Baptist life. Targeting Southern Baptist clergy and laity – many of whom are yet unaware of the dimensions of the debate – this volume is especially significant in that it seeks to establish a theological and ecclesial firewall against further Calvinist advances. At the moment, the internecine battle could tilt either way. The aforementioned Christianity Today article notes that thus far, Southern Baptist congregations are less receptive of Southern Seminary’s Calvinist grads than Mohler desires. The authors of Whosoever Will repeatedly warn that Calvinism threatens denominational and congregational vitality. Kerry R. Bunn, Body Betrayed: My Journey Through Sickness and Faith (Ringgold, Ga: self-published, 2010, 222 pages, paperback). Technology, theology, despair, hope, and transparent honesty come together in this inspiring and unusual volume. Kerry R. Bunn is the senior pastor of First Baptist Church of Ringgold, Georgia. A minister for 35 years, he and his wife, Cathy, have two adult children and seven grandchildren. His ministerial and family profile, at first glance, is similar to that of many Baptist pastors of his age. Yet Bunn lives day to day in agonizing pain, and his journey of the past year-and-a-half plumbs the depths of bodily suffering, probing the question of God’s will with remarkable openness. Body Betrayed evolved out of Bunn’s blogging of his sickness, and conveys the story of Bunn’s medical and faith pilgrimage day-by-day, week-by-week. It is as close as a book can come to being “live.” The volume is at times raw and jarring, reflecting the personal anguish of the author. Yet Bunn’s pilgrimage is also one of faith strengthened through trials, shared openly with the reader, for the purpose of encouragement in one’s own journey. And in the end, there is no end to Bunn’s pilgrimage; the medical diagnoses continue to unfold, the pain remains, hope is firm, and behind a pulpit each Sunday in Ringgold, Georgia, stands a man who is the embodiment of frailty and faith. “I am a Baptist because I believe plain reason, careful interpretation of the Scriptures and the prompting of the Holy Spirit always will be superior to blind obedience to human authority. I am a Baptist because in this denomination my conviction need never yield to another’s save through honest and open debate. I am a Baptist because here my congregation can come to its own conclusions and fearlessly challenge mine. I am a Baptist because I value truth over conformity. I am a Baptist in the hope that my children will learn from my errors as well as my triumphs and see more clearly than I because they dared to disagree.” From a Baptist Standard editorial by Scott Milam, a student at Baylor University’s Truett Seminary, preparing to be a minister of education or discipleship, and a member of First Baptist Church of Woodway. “I call myself a Bapto-Catholic. I believe that I have been called to bring the immense artistic and theological richness of the Catholic tradition to bear on the lives of my largely Protestant student audience at Baylor.” Ralph C. Wood, Baylor professor, in his recent convocation address at Providence College, Rhode Island. “On nearly all basic demographic characteristics, there are no significant differences between Americans who identify with the Tea Party and those who identify with the Christian conservative movement.” Robert P. Jones, head of Public Religion Research Institute, and Daniel Cox, the Institute’s director of research, summarizing survey findings regarding the relationship between the Tea Party movement and the Religious Right. “There is no contradiction between calling on the government to protect the free exercise rights of all people and sharing the gospel. Indeed, defending free exercise rights for everyone sends a powerful message of love and confidence in one’s faith. Likewise, calling for equality in religious liberty certainly is not the same as saying that all religions are equally true. Instead, it’s a call for government to leave theological matters in the hands of people of faith and their communities.” Melissa Rogers, director of the Wake Forest University Divinity School’s Center for Religion and Public Affairs, in the Baptist Joint Committee’s Report From the Capital, Vol. 65 No. 8, pages 4-5. “The Bible that people want is the Bible we built.” Jeremy Howard of the Southern Baptist Convention’s Broadman & Holman, quoted in Georgia’s Christian Index, September 23, 2010, p. 7, speaking of the newly-released HCSB Study Bible. “If the cases of reported [clergy sexual] abuse were spread evenly across the country, every average-sized congregation with 400 members would include seven women who have experienced clergy sexual misconduct at some time since they turned 18. That includes only women who go to church regularly, not those who stopped attending after their abuse.” Diane Garland, dean of Baylor University School of Social Work and co-author of a groundbreaking study on sexual malfeasance by ministers, describing how ‘pervasive’ clergy sexual abuse is today, as quoted in an Associated Baptist Press article. “Human beings are lousy gods. But at our best, we are loving. We build healthy families, strong infrastructures and united communities. We tithe through gifts, and pay taxes to keep this country strong. The siphoning of our generosity, our patriotism, for the excessive accumulation of the few, is misguided at best, evil at worst.” Alanna Kathleen Brown, retired Montana State University English professor, addressing the shortcomings of economic policies that concentrate a huge portion of a nation’s wealth in the hands of a few, as quoted in the Bozeman Daily-Chronicle, October 1, 2010.